An art sculpture which commemorates the Hillsborough victims has been moved to a new home at Liverpool John Lennon Airport. 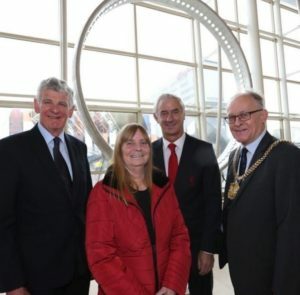 ‘The Band of Life’, which was commissioned by the Hillsborough Family Support Group, had been sitting for three years at the atrium in the Liverpool Echo building on Old Hall Street. It was also a focal point during the annual memorial services at Anfield which ended in 2016, but now the aim is that it will be seen by more people as they pass through the doors of the airport. The sculpture is a full circle with 96 illuminated lights to symbolise the victims of the tragedy, which has proved a comfort to the families, friends and survivors who came together after the tragic event of 1989. It was officially unveiled in its new home at the airport in a special ceremony on Thursday, attended by Lord Mayor, Councillor Malcolm Kennedy, representatives of the families and senior airport managers. Sue Roberts, a spokesperson for Hillsborough Family Support Group, said: “We love the new location. We shared information and great ideas with all families and they thought it was great.